The SGMSH servomotor series has a high torque-to-inertia ratio and incorporates the segmented stator design, which dramatically reduces overall size. 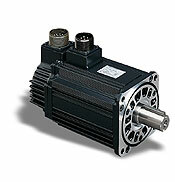 These servomotors are well-suited for high cycle-rate applications. There are 6 sizes from 1kW to 5kW providing up to 422 lb-in (48 Nm) of peak torque. 200 and 400 volt windings are available with rated speeds of 3,000 rpm and maximum speeds of 5,000 rpm. A 131,072 ppr incremental serial encoder is standard. The SGMSH is rated IP67 (not including the shaft) providing resistance to moisture. Options include a 131,072 ppr absolute encoder, shaft seal, and holding brake.